The pair collaborated for a song on the Spider-Man: Into the Spider-Verse. The new animated film Spider-Man: Into the Spider-Verse came with a massive soundtrack featuring artists such as Lil Wayne, Ty Dolla $ign, Vince Staples, and Post Malone and Swae Lee, who teamed up for the song "Sunflower." 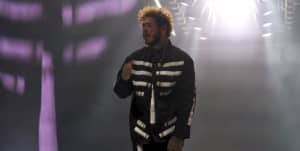 The song's music video, streaming above, is reminiscent of another Post Malone hit, "Congratulations," with its focus on studio footage and the friendly chemistry between the two artists. Check it out above. Both Post Malone and Swae Lee recently shared singles over the holidays: Malone dropped a new single called "Wow." and Lee's group Rae Sremmurd came back with two new songs "Christmas at Swae's" and "Nothing For Christmas."